WASHINGTON - Family members of Japanese nationals abducted by North Korea in the 1970s and 1980s on Wednesday pressed the reclusive state to immediately return all kidnap victims. They made their demand in the United States ahead of the upcoming meeting between U.S. President Donald Trump and North Korean leader Kim Jong Un. Trump has promised to raise the abduction issue during the meeting. Speaking after a meeting with former U.S. Deputy Secretary of State Richard Armitage just outside Washington, Takuya Yokota, whose older sister was abducted, said he was encouraged by Armitage’s comments that Kim has no right to say the issue has been settled and that it is only the victims’ families who can declare it closed. Yokota’s sister, Megumi, was taken from Niigata Prefecture while on her way home from school in 1977. She was 13. Japan officially lists 17 citizens as abduction victims and suspects North Korea’s involvement in many more disappearances. While five of the 17 were repatriated in 2002, Pyongyang maintains that eight — including Megumi Yokota — have died and the other four never entered the country. “I told Mr. Armitage that it is important to achieve the immediate return of all abduction victims,” Yokota said. Aside from Armitage, abductees’ kin and lawmakers supporting them met with U.S. State Department and Defense Department officials. Koichiro Iizuka, whose father, Yaeko Taguchi, was kidnapped in 1978 at age 22 from an unknown location, said he would like to request that Trump push the issue. Given that North Korea has also abducted people from other parts of Asia, the Middle East, Europe and elsewhere, while also detaining three Americans, Iizuka said he would like the United States to take the lead in resolving issues involving abduction victims from around the world. 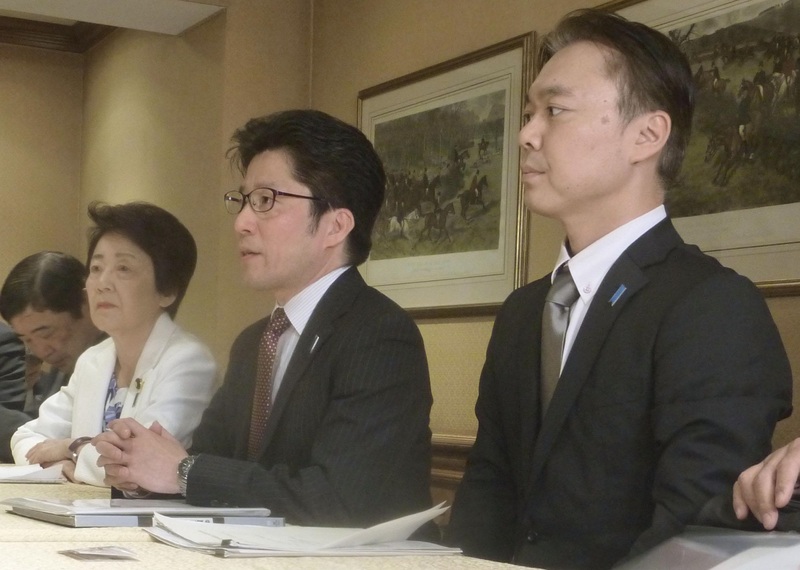 Speaking alongside Yokota and Iizuka, Eriko Yamatani, a former minister in charge of the abduction issue, urged North Korea to abandon its nuclear weapons and missiles, as well as address its alleged human rights violations and resolve the abduction issue so that it can develop as a peaceful nation. “North Korea has a diligent workforce and is blessed with resources. If Pyongyang changes policy, it could advance as a peaceful nation,” said Yamatani, a Liberal Democratic Party lawmaker in the House of Councilors. “We would like to take action toward achieving the return of all abduction victims,” she said. In an effort to boost Japan-U.S. solidarity over North Korea, Yokota and Iizuka are scheduled to meet in New York on Thursday with the parents of Otto Warmbier, a University of Virginia student who died last year soon after he was released from the North while in a coma, following more than 17 months’ imprisonment. The four will meet on the sidelines of a symposium on North Korea’s human rights situation at the U.N. headquarters.